GoDaddy Workspace email is the free email that you get when you purchase hosting from GoDaddy. While this email is useful for any business communication, it is also tedious to keep up with both Gmail and this email. How cool it will be if you can check both your personal as well as GoDaddy email right from inside your Gmail? I am sure it will help. Not to forget that this set up not just allows you to receive emails on Gmail but also you can also send a reply with your business email. So lets see the steps to set this up. How to receive GoDaddy email on Gmail? Step 1: Login to your GoDaddy account and from Workspace email click on Manage. Step 2: Click on Email Setup Center for the email that you want to forward. Step 3: Open your Gmail in new tab and go to settings from the gear icon. Step 4: Under Accounts and Import tab, click on Add a POP3 mail account you own. Find it in Check mail from other accounts. Step 5: Add your GoDaddy email address and click on the Next Step. Step 6: Enter the mail settings for the GoDaddy email that you are forwarding. Here, enter your GoDaddy email as username and enter your email password too. For the POP server, you can refer to Email Setup Center that you have opened in other tab. 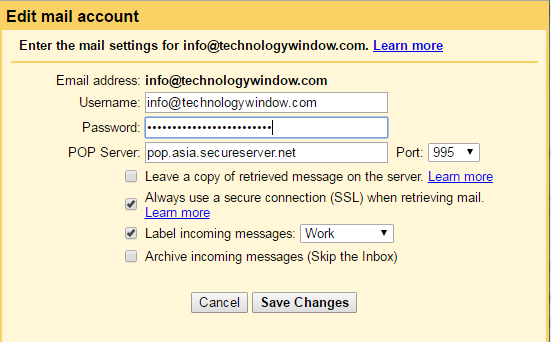 Select 995 port if you are checking the option to retrieve emails using secure connection. Label incoming messages as Work or anything that you want. It will help you in identifying which emails are coming from GoDaddy Workspace email to Gmail. Step 7: Click on add account. You will be asked here if you want to send email as the another email address that you own. So just go ahead and move to next step to configure send mail as settings. How to send emails from Gmail as GoDaddy email? Step 8: Add your GoDaddy email and check Treat as an alias if you are the only owner of both the accounts. Click Next Step. Step 9: Like Step 6, enter username and password here also. For the SMTP server, refer to Email Setup Center of GoDaddy email. Select port 465 for using SSL. I strongly advise you to use secure connection to send your messages from Gmail. Click Add Account. Step 10: Verify that you own GoDaddy email using the link which you will receive in your Gmail after this final step. You can also verify it with the code. After this final step, you will be able to send and receive GoDaddy email through your Gmail. To avoid selecting email everytime when you are replying from Gmail, check the option “Reply from the same address the message was sent to” from Send mail as option under Accounts and Import tab in Gmail. Although Gmail checks automatically for any new messages in your GoDaddy email. You can simply click “Check Now” from the Accounts and Import tab, everytime you login to Gmail. It will check for any messages instantly.